On July 8, Italian two-wheeler giant Piaggio Vehicles, the wholly-owned subsidiary of Piaggio group launched a special edition of Vespa scooter which is priced at Rs 74355 (ex-showroom Delhi). In the past weeks, Piaggio has showcased the scooter in special previews conducted in Pune, Hyderabad & Bangalore and there has been a great response from Vespa loyalists. Mr Ravi Chopra, Chairman & Managing Director of Piaggio Vehicles said, "Piaggio is delighted to offer this stylish limited edition Vespa Esclusivo for the fans across the nation. Limited edition Vespa Esclusivo symbolizes Piaggio's position in the premium scooter segment that the group has successfully created in the Indian market. It takes the legacy of iconic Vespa to another high. With its classy yet quirky design, it will be a proud possession of any real Vespa enthusiasts. We at Piaggio, understand the needs of our aspirational consumers and believe that the Esclusivo will enable them to experience another notch in the Vespa culture of being special." Truly, Vespa has made a special place in the hearts of youth. Continue reading the article to know more about it. Vespa's first ever limited edition model in the country comes with a host of aesthetic upgrades designed exclusively to match the taste of today's lifestyle oriented aspirant youth. This scooter draws its features from the ultra-stylish Vespa VX. 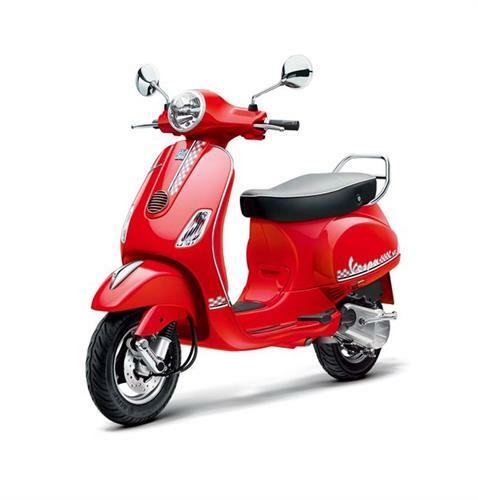 It makes a fashion statement with its bright hues, trendy graphics & stylish new checkered body decals and like the premium Vespa VX, is very youthful in appearance. The specially designed alloys sport a new dual-tone, black & silver color scheme and the seats have been particularly designed in a grey top & black side theme which get a good contrast from the colored stitching & piping (white piping with white stitches in red body color and red piping with red stitches in white & matt black body colors). All this adds to the visual appeal of this limited edition and truly anybody would love to own this bright & electrifying scooter. At least I would if my parents give me Rs 74,355. The Vespa Esclusivo is available in 3 colors: Rosso Dragon (Red), Monte Bianco (White) and Nero Matt (Black). All colors look very good and it is difficult to choose one. As this is the first limited edition Vespa in India, only 1000 units will be manufactured. Each of these units will be numbered and will be flaunting distinct number badges on their front compartment storage lids to separate them from the other models of the company. Mechanically, the Vespa Esclusivo is identical to the regular Vespa VX. There have been no changes to the powertrain and it continues to use the same 125 cc, 3-valve, 4-stroke engine that gives a maximum power of 10 bhp @ 7500 rpm and a maximum torque of 10.06 Nm @ 6000 rpm. Like the VX, the Esclusivo single-cylinder, air-cooled engine is mated to a CVT automatic gearbox. The Vespa Esclusivo edition is priced at Rs. 81,786/- (ex-showroom, Mumbai) and Rs 74,355 (ex-showroom Delhi). Its pre-bookings have already started and deliveries are expected to commence in coming few days. The company plans to introduce more such distinctive offerings. It will launch at least one limited edition model every year in the future and each model would be exclusive and individually badged. Piaggio Vehicles Pvt Ltd started its operations in 1999 with the launch of its three-wheeler model, Ape. The company has always been known for its bright, youthful models and has gained a sudden popularity in India in the past few years with the launch of its designer models. We expect a lot from the Piaggio. Do share your opinions with us by commenting in the box below.